We haven’t asked this question since 2013 because it never seemed to vary from year to year. One would think your opinions would have changed over the past three years, but this is not the case. The top three in our survey results this year parrot surveys all the way back to 2010. However, below that, there are new choices on the list. To me, Pix Pâtisserie stands out at the top of the pack because, with only one location, it has less exposure than the rest, so congratulations to them. New to the list, St. Cupcake, 50 Licks Ice Cream, St. Honoré, Lovely’s Fifty-Fifty and Lauretta Jean’s. 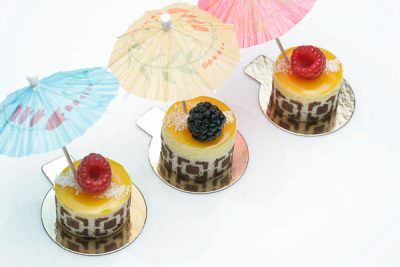 Indulge – it’s summer! Remember, you always have room in your dessert tank. I have a soft heart in my heart for Pix. In the good ol’ days the people behind this site used to meet there and compare review notes. The first ‘Dude liked the dessert wines, while the rest of us were more partial to the sparkling selection, one of the largest in the nation. But most people come to Pix for the fancy desserts. Like many bakeries and dessert spots, the food looks really good, but there is one difference – they generally are as good as they look; what a nice change from the norm. Pix has cakes, macarons, and fancy pastries, but they grabbed me with a new line of dressed up eclairs. If you were reading this blog back in 2005, you’ll remember my love affair with the pastry. Rotating flavors from Pix Patisserie include Fleur de Sel Caramel, Bourbon Cherry and Strawberry Rhubarb. Pix has won the crown of World’s Best Champagne & Sparkling Wine List four years in a row from The World of Fine Wine, in London. Go, enjoy the funky laid back atmosphere, the huge wine list, and free Movies at Dusk in the beer and cider garden every Wednesday. 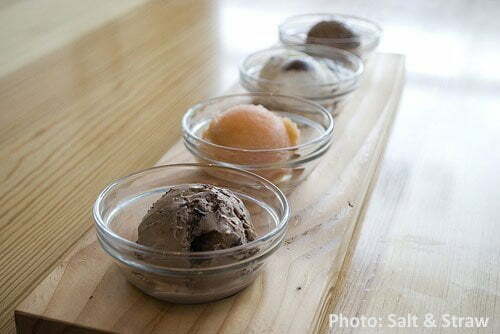 S&S is known for using local artisan products and pushing the boundaries of the “normal” flavors. A few examples, Ancient Heritage’s Lemon Curd & Whey, Toasted Baguette PB&J, Breakside Brewery’s Spnt Grains & Bacon S’mores, Celery Root & Strawberry Celery Leaf Jam, Pear and Blue Cheese. My experience with various flavors has been uneven. Some are good – Strawberry Honey Balsamic with Black Pepper, and some, like Loaded Baked Potato, have been lousy. I’d guess it is the more standard flavors that bring in the crowds; the rest are more “ooh, look at us!” My favorites are the Freckled Woodblock Chocolate and the Olive Oil. Give me a pint of the former to share with good friends and I’m happy. Insider tip: instead of waiting in line, jump ahead and get a pint out of the cooler to take home. It’s ok, they encourage it. 2035 NE Alberta St., Portland OR 97211 Map (503) 208-3867 11 am – 11 pm daily. 838 NW 23rd Ave, Portland OR 97210 Map (971) 271-8168 7 am – 11 pm daily. 3345 SE Division St. Portland 97202 Map (503)208-2054 11 am – 11 pm daily. I rolled my eyes when I saw Papa Haydn placing so high, but on a whim, I dropped by the Milwaukie location and indulged in a couple of desserts on their great patio. If you watch the British Baking Show, you’ll recognize many of the desserts. They are classics, and yes, you’ll find a long list of fancy cakes in fancy shapes, mirror finishes, gélee and more. Not expecting much, I ordered a Rhubarbarella, made up of pistachio cake, rhubarb mascarpone mousse, fresh strawberries and strawberry gélee. The dish was beautiful, the strawberries full of flavor, and my only complaint is that the pistachio cake base was a bit dense. I’ll say it here – I was wrong. Based on the dishes I had that night, the food has improved quite a bit. Not only that, the service was some of the best I’ve had in ages. 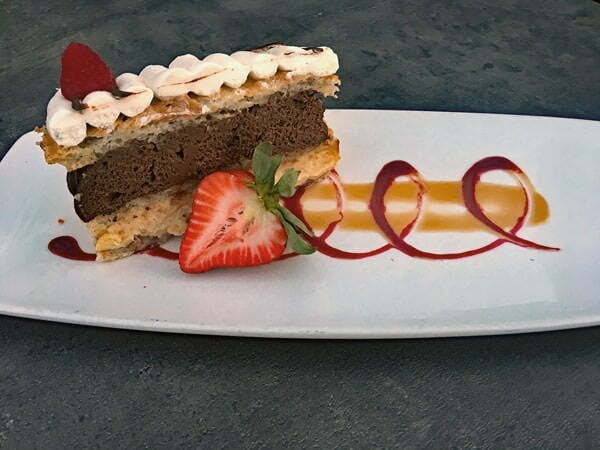 While Papa Haydn has a full restaurant menu, the desserts are the stars of the show. You’ll find cheesecake, tarts, crisps, cakes, ice cream and more. Plunge into the impressive collection of older style desserts like Baked Alaska, Bourbon Balls, Cassata and more. Bring your camera; you’ll want to Instagram your plate. I have had a thing for Ruby Jewel ice cream sandwiches since they first appeared in local farmers markets in 2004, and I still pick them up when I’m having a weak moment at the grocery store. They have become so popular you can buy the ice cream sandwiches all over the West Coast, and they were a favorite in Oprah Magazine. 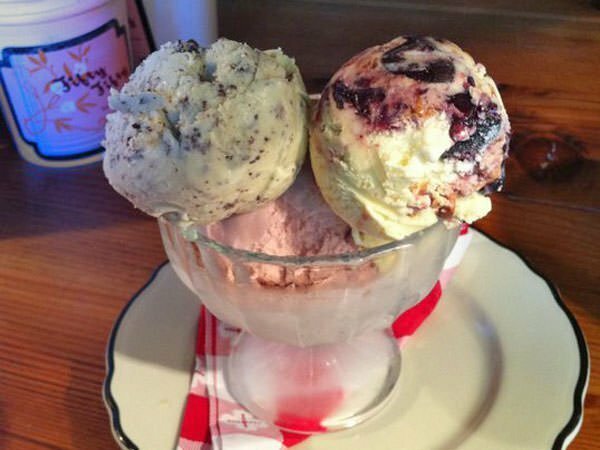 Now Ruby Jewel has three shops, where they sell scoops of homemade ice cream with locally sourced ingredients. Flavors are mostly traditional. Oregon Strawberry. Caramelized Coffee. Cookies and Cream, Butterscotch with Oatmeal Chocolate Chip Cookies. Yes, you will frequently find a line. I’ve seen people wait in the rain. Oh Lauretta Jean’s. 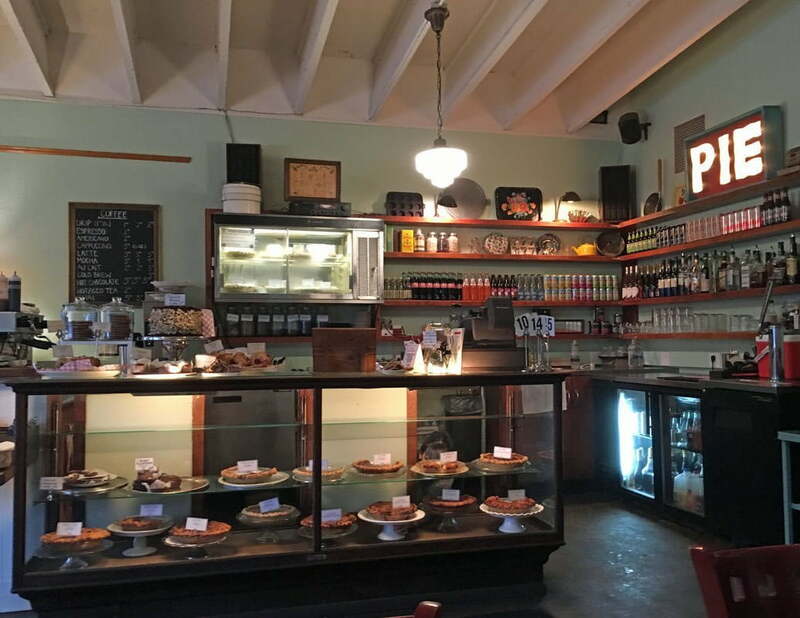 I love so many things about you; your quaint Division street store that is a throwback to my college days, your old fashioned pies, scones and desserts. It’s no wonder that your store is always busy with an eclectic mix of happy people. 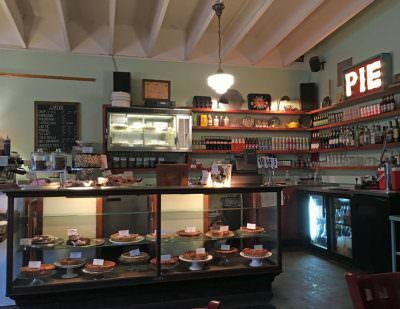 They aren’t just there for the pie, it’s the whole vibe and the good service. For me, it is a flashback to growing up on the ranch with my grandmother baking pies; I’ve written about it before “For dessert, we always had her famous chocolate pies. When the meringue cried, she always said they were angel’s tears”. You’ll find a wide selection of pie, all pretty much tried and true standards like Boston Cream, Coconut Cream, Lemon Meringue, Chocolate Cheese, Chocolate, Strawberry and more… whatever fruit is in season will always be featured. Truth be told, Lauretta Jean’s is a regular indulgence of mine, though I’m not a huge fan of the cream pies – I want a higher fruit to cream ratio. Morning hours you can get a nice brunch, and at night you’ll a busy vibe, classic cocktails and of course, pie. The SW Pine Street store is much more limited than the Division store, or at least it was when I went in a few years back. You’ll also find Lauretta Jean’s at the PSU Portland Farmers Market. Le Pigeon is one of the best restaurants in Portland. I always get dessert during my meals, but it never occurred to me to stop here just to get dessert, and with the constant crowds of excited folks waiting to dine, I’m not sure if you could get away with it. However, you want to get a full dinner here; just trust me and make plans accordingly. Owner Gabriel Rucker has been awarded more worldwide articles and awards than just about anyone around, including winning James Beard Awards for Best Chef: Northwest and Rising Star Chef of the Year. As of this writing, there are five desserts available: Vanilla Crème Brûlée, pineapple-thyme scented pots de crème; Foie Gras Profiteroles caramel sauce, sea salt; Lemon-Cherry Layer Cake pistachio, preserved cherries, elderflower-champagne sorbet; Grasshopper Ice Cream Pie basil-chocolate chip ice cream, chocolate crémeux, pecan meringue, chartreuse lime syrup and a daily sorbet. I’ve never had a dessert I didn’t like at Le Pigeon. Heck, I’ve never had a meal I didn’t like here. Insiders tip: Little Bird Bistro, also by Gabriel Rucker, is not quite as busy and has a similar style dessert list. Lovely’s Fifty Fifty is first a pizza restaurant, and to emphasize that, it just came in at the number three spot on our Best Pizza in Portland list. However, they make lovely ice cream and have a little scoop shop out front along Mississippi Avenue. 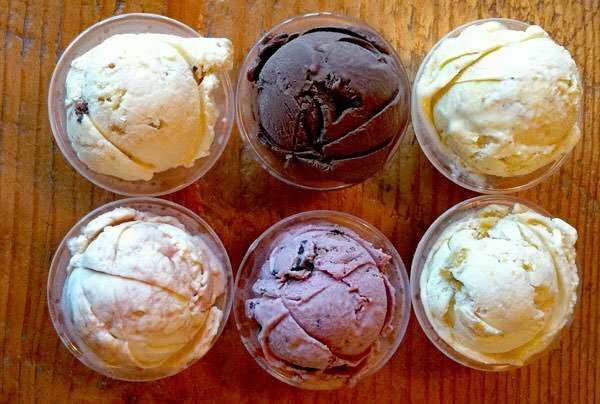 Ice cream is always homemade and local. Current flavors: Strawberry Buttermilk, Elderflower, Salted Caramel, Mint Stracciatella, Malted Milk Ball and Honey Lavender. If you aren’t looking for a full dinner, drop by, pick up a cone and take a wander around the neighborhood. Pretend you are in Italy, and everyone else is a damn tourist. Of course, you can do the smart thing and have pizza and ice cream, though I would suggest you not plan a long car ride after doing so. Just sayin’. 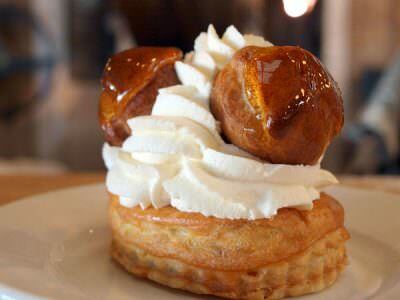 The St. Honoré chain has been expanding quickly and has a legion of followers. As they have grown, so has the food menu, with brunch and lunch popular options. My results here have been hit and miss, with some pastries not living up to the “is it as good as it looks” test. I stick to the basics, Kouign Amann, Canalet, and the Apple Chiboust, a layer of thin crust, a layer of cooked apples, layer of custard, and a flamed sugar topping. Oh, and the eclairs are nice too. A gluten-free menu is available. When I first wrote this, I hadn’t tried 50 Licks, and promised to rectify that. This weekend I dropped by and really enjoyed the experience. The store isn’t as slick as the Salt & Straw ilk, but it feels much homier. The wall is covered with Tintin book drawings, and the space is large and casual, with a few community tables. 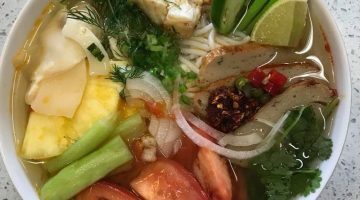 The flavor list is all Portland – Thai Rice, Coconut Lemon Saffron, Rose City Lemonade, Chocolate As @#$& (their word, not mine), Blackstrap Gingersnap and more. They had me at “rice pudding infused with pandan… and the “ButterSCOTCH” which is supposed to be boozy (update – it is). So much for my diet, but on the other hand, I did this for research. You’ll also find Beer Floats (yes, real beer), Shakes, and Affogato and more. These folks seem to be all about the booze. Four vegan flavors are currently on offer. I will take a photo and update this post. St. Cupcake. You know you want to bring these to your next party. When it seemed like cupcakes were taking over the world a few years ago, St. Cupcake was the first on the Portland scene around 2005 followed by Cupcake Jones. I had thought cupcakes had lost some of their popularity until I looked up the addresses for this post and found they now have four locations. They have around a dozen varieties each day, along with three vegan options. 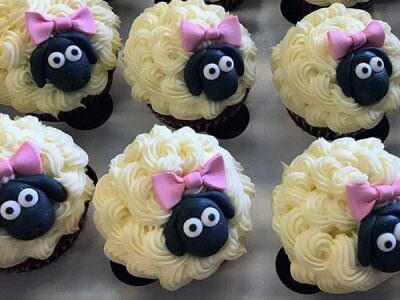 In my opinion, they are everything a good cupcake should be. 2011: Restaurants: Paley’s Place, Nostrana, Castagna, Tabla. 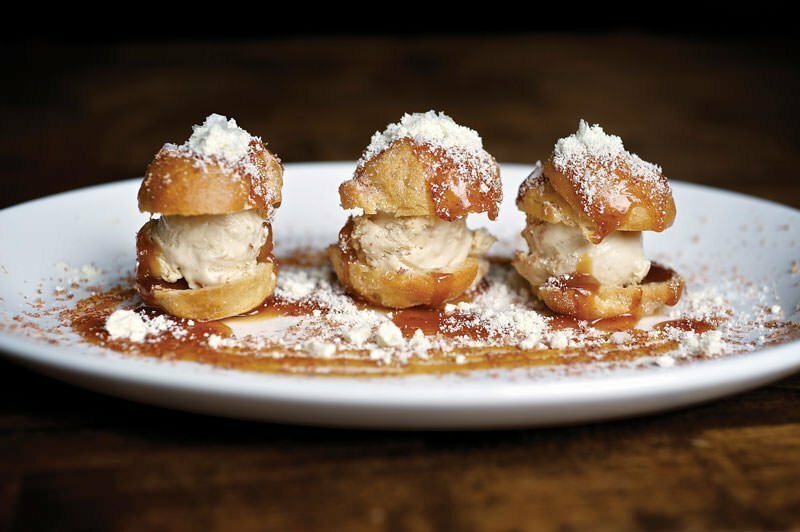 Dessert Destinations: Pix, Papa Haydn, The Sugar Cube, Two Tarts, Random Order. Category: Portland Food and Restaurant News and Discussion. Related posts about 50 Licks Ice Cream, Lauretta Jean's Pies, Le Pigeon Restaurant, Lovely's Fifty Fifty Restaurant, Papa Haydn, Pix Pâtisserie, Ruby Jewel Ice Cream, Salt & Straw Ice Cream, St. Cupcake Bakery, St. Honoré Boulangerie. What about Pinolo? Sublime. I think it’s better than all the ice cream joints. They would have been next on the list.